And How Did He Get to the North Pole? A solid and likable alternative story about how Santa became the man in the big, red suit, perfect for inquiring young minds. Many children of a certain age start to wonder about Santa. Stephen Bigalow’s charming story—complete with toys, elves, flying reindeer, and candy canes—sheds a little light on the magic of Christmas. This sugary, easy read is perfect for motivated early readers, and it creates a whole new backstory for Santa. Bigalow is obviously captivated by the modern Christmas spirit. His reminiscences of the sights and sounds of the season in the opening chapter speak of his reverence for long-held traditions. He introduces the many names Santa is known by and mentions the decorating of the tree and the warmth of the fireplace. This establishes the familiar ground onto which he crafts his very new tale of discovery, Who Is Santa? There is very little of the traditional folklore in Bigalow’s tale, and although the concepts are original, they do shy away from the mysterious and into the ordinary. In this story, Santa is a toymaker who hadn’t thought about sharing his toys with children until he runs out of storage space. Then he and Mrs. Claus feel threatened by a “ruling class” and decide to relocate. They end up at the North Pole by pure coincidence. The author succeeds in building a plausible history for Santa, the elves, the reindeer, and their worldwide journey on Christmas Eve. Once Santa is settled in at the North Pole, he meets the grumpy and mischievous Elfins. As Mrs. Claus feeds them pie and candy the color returns to their cheeks and their eyes brighten. To keep them cheerful, the Elfins, who become known as Elves, are constantly fed candy. But life is not all glad tidings for them, and Santa occasionally comes off as short-tempered and frightening. When Santa discovers that an elf named Norman is secretly teaching reindeer to fly, he assumes that Norman is goofing off while the other elves are hard at work. His reaction is completely unexpected for jolly ol’ St. Nick. He orders Norman out of the workshop, and the elf curls up in a sleigh and cries until Mrs. Claus finds him. This episode and others like it expose Santa’s “human nature.” Whether or not readers appreciate the complexities that have been created for Santa’s personality, Bigalow’s story is fun to read. Many of the illustrations, particularly the one depicting the arrival of a caravan of wagons to the Hidden Valley at the North Pole, are beautiful and perfectly capture the mood. However, several of them appear to be hastily done or have distorted features or perspectives. An illustration of Santa and Mrs. Claus driving a wagon into the woods is drawn from the perspective of someone in the wagon behind them. It lacks dimension, and the depiction of the woods in front of them is flat and confusing. Despite the misalignment of some of the details on faces and toys, the bright colors are appealing. 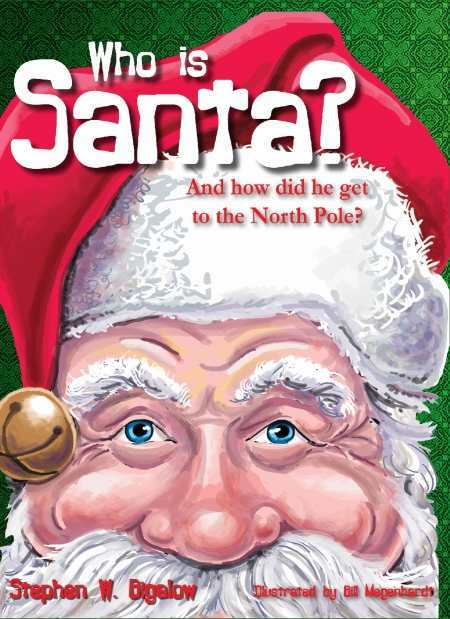 Bigalow set himself up for a challenge in writing about Santa, but he met the challenge admirably and wrote a solid and likable story for inquiring young minds.